The Re/Max real estate office at 4th Avenue and Garfield Place in Park Slope, Brooklyn looked like this in May, 2013 before the installation of some sustainable urban greenscaping. Look below to see what it looked like on August 11 when I stopped by to check on the plants. They were installed the last week in June . The project was a cooperative effort by me and the Forth on Fourth Committee (FOFA) of the Park Slope Civic Council. The objective was to create a living demonstration of the benefits of sub-irrigated planters for other merchants and residents on 4th Avenue and the surrounding neighborhoods. The input from the owner of Re/Max was short and simple: "You know what you're doing. Please don't block my windows." Next year there may be sub-irrigated window boxes on the upper stories and a roof-top garden. Stay tuned for a potential Brooklyn SIP showplace. The plants are growing in adequately sized Fiskars Veranda planters purchased on Amazon. The simple DIY sub-irrigation reservoirs are recycled juice bottles. The simple, straightforward design was accomplished with Junipers and Petunias. There's nothing over the top in an attempt to be grandiose. Next year there might be flowering vines growing up the columns (maybe Clematis). Re/Max office staff has cared for the plants since installation. There is no need for green thumbs or an outside maintenance service. All it takes is a soil probe, funnel and watering can. These plants have held up beautifully through several stifling Brooklyn heat waves over the summer. They are a living tribute to the environmental benefits of sub-irrigated planters (SIPs). Come to the workshop this coming Sunday and stop by the Re/Max office to see SIPs in action with your own eyes. Seeing is believing! This is what it looked like right after the installation. Meet the WonderBox! Finally...a window box that's a plant grower...not a plant killer. It is sub-irrigated and made from a commercially available planter. See and learn more about it tomorrow at the Wonder Garden! There's a 2 gallon reservoir and it still has plenty of room for plant roots. Row house gardening, in particular, will never be the same. It's going to be a cloudy day here in Brooklyn and a respite from the heat, however brief, will be most welcome for the fire escape salad bar. If these greens were growing in traditional drain hole planters instead of sub-irrigated planters (SIPs) I would need to be here all day, every day. That is why we have wilted plants all over the city. Other than retirees, who has time to be a plant nanny? The sun is shining in Brooklyn. The fire escape salad bar greens are growing. The question du jour once again is why doesn't every person in every city know about sub-irrigated micro gardens like these? They produce healthy fast food, are food safe and kid simple! In my view they would help solve nutrition and obesity problems much more effectively than a dirt garden on the White House lawn. It appears to be an attempt to solve today's problems with yesterday's solutions. It is a cloudy, rainy Friday here in Brooklyn. I have not picked any leaves yet but will soon. There are many salads soon to come out of these planters. What if everyone had at least one sub-irrigated planter (SIP) salad bar like this? While urban farms and community gardens have a purpose, we do not need them to teach all city dwellers about food production on a very personal level. This is about self-sufficiency. Growing fresh food like this is an easy to learn skill that everyone should have. It is easier to learn than using an iPhone or iPad. Why are our horticultural institutions mute on this important urban food production technology? They have a public responsibility and are failing to live up to it. Call them out about it! If I were going to create a vertical garden, this is the way I would do it. These planters are not sub-irrigated but they should be. Picture these sub-irrigated window boxes on the steps of this easy to build frame. The productivity of a vertical garden like this would be awesome. It could be the mother of all salad bar gardens. Without a wall to lean on, it would need to be built as an A-frame. Then there could be sub-irrigated planters (SIPs) on both sides of the A. Sun orientation and crop selection would be important factors, but this is an idea just waiting to happen. My fire escape salad bar has two sub-irrigated "serving trays". The one on the left is a City Pickers sub-irrigated planter (SIP) from Home Depot. 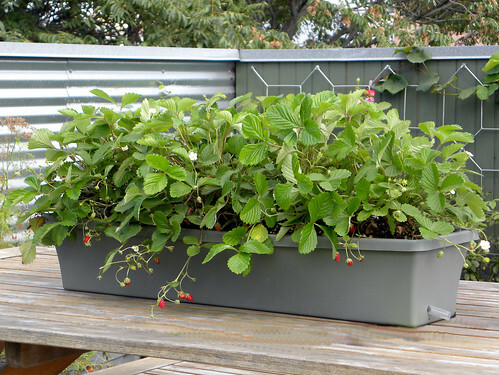 The small window box is a conventional drain hole planter converted to sub-irrigation. I haven't picked any leaves yet but we're getting there. Incidentally, because of end-stage osteoarthritis in both knees (to be replaced), I cannot power walk daily as I used to. As a result, my weight slowly climbed up to 220 pounds. I finally realized the strain these extra pounds were putting on my knees, along with the negative aspects regarding my overall health. As a result of a "calorie reduction" program (as in not eating so much) and eliminating ice cream, chips and pretzel snacking I have lost 40 pounds since last November. I eat only two meals a day, oatmeal and fruit in the a.m. and stir-fry or salad for dinner, no junk food. My meals never tasted so good. The two meals a day method is probably not what a dietitian would recommend but it is working for me. Now the trick is to avoid gaining it all back. I’m looking forward to salads made from assorted fresh picked fire escape salad greens. 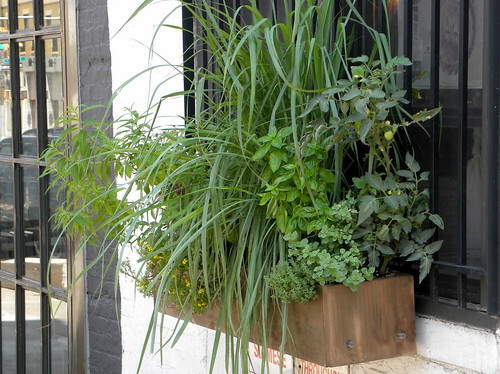 These photos of sub-irrigated window boxes are featured in a recent Brooklyn Based blog. None of them are store bought "self-watering" planters. Each of them was converted to sub-irrigation using the simple method shown in this prior post. Regardless of what your gardening books, houseplant books, garden writers and the USDA extension program say, drainholes in planters are an utterly dumb idea. They waste water, your time, your money...and ultimately your plants. The plants in these SIPs are shouting about it. Can you hear them? This is one of those ordinary window boxes with drain holes that you see everywhere if you live in the city. The majority of them are fully equipped with tired looking plants, many of them often in wilt. Window boxes may well represent the biggest potential for sub-irrigated planters (SIPs) in the city. This is certainly true here in Brooklyn. Drain hole window boxes are on window sills and stoop steps in every row-house neighborhood. You will be amazed by the difference in plant health if you convert your window boxes to become sub-irrigated planters (SiPs). It is very easy to do and well worth a small amount of your time. You will grow more healthy plants while saving water and time. If you grow plants on a balcony, you will not drip water on the balconies below. There is no drainage of water. SIPs are self-contained systems. Incidentally, forget that “self-watering” nonsense. There is no such thing. The benefit of the SIP is that it supplies both water and oxygen to the root system.